So glad you're joining me today. Can you believe Christmas is in 5 days?!?! Our nice list is overflowing and as I look back at this year and all the help, support and love we've received, I'm overwhelmed with emotion. It hasn't been an easy year for our little family, but it's been one of the most comforting, and it's all because of everyone who's stepped in to offer a helping hand. We couldn't be more grateful. I'm also especially touched by all of you! Whether you stopped by to say hi or sent well-wishes or comforting thoughts, I hope you know how much it has meant. I am beyond-words-thankful for all of the visits, comments, and support here on my little blog. On the days that things are really hard, I hope you know how much strength and comfort you provide. Thank you from the bottom of my heart!! 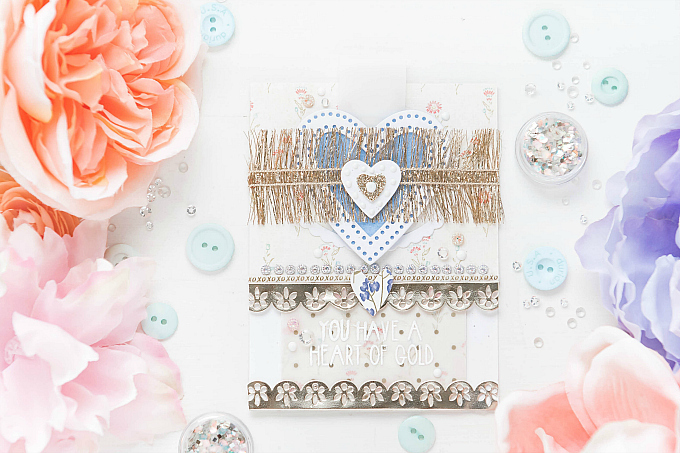 Speaking of hearts and thank you's, today I am sharing a Delicate Series card that is a little bit Valentine's, a little bit Thank You and every bit as special as the person it was made for! I recently sent this out to a crafty friend who has been so very kind to me over the past few months. She's helped me in countless ways - especially when it comes to all this newness I've experienced with leaping into the land of Instagram! 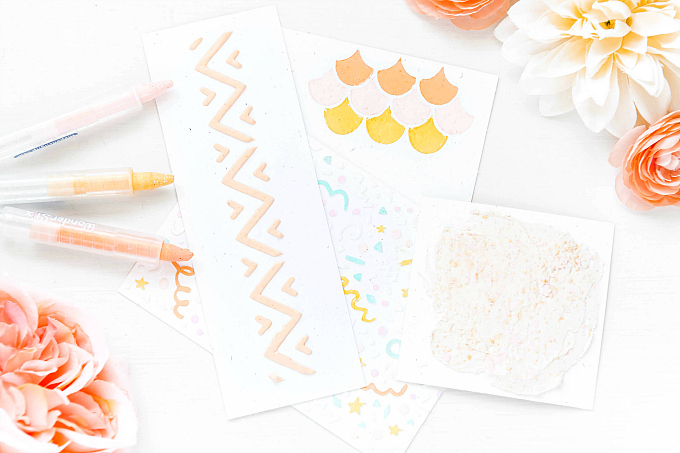 You can check out her beautiful blog, and all of her incredible talent here. Thank you so much, Lea!! To start my card today, I used an older design idea, but decided to make it even more decadent! I used floral paper for the top and white cardstock for the bottom base, along with a teeny bit of vellum. 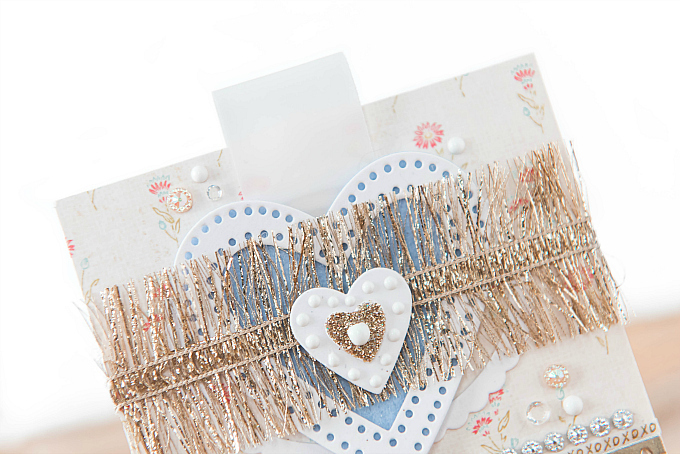 At the top of the card, I added my most favoritest gold fringe trim, which I found at Hobby Lobby a few years back. Underneath that, I added a layered heart, using PTI's Limitless Layers: Hearts, cut out of cardstock and blue felt. I also added a tiny heart from PTI's Heart Prints, accented by some glitter and Nuvo drops. 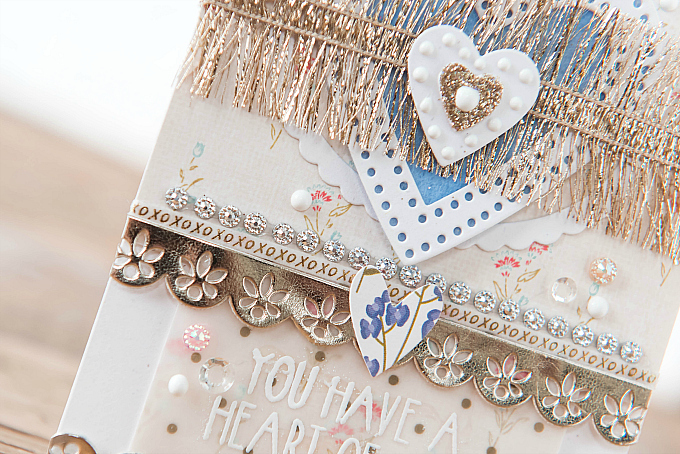 Across the card, I added a trio of trims. 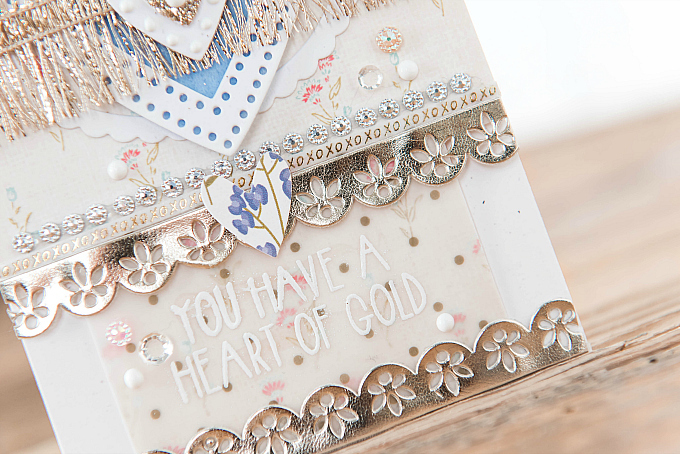 A rhinestone dazzler, a tiny washi layer, and a pretty gold trim (also from Hobby Lobby), all topped off with a botanical print heart. I scattered PPP clear jewels, Nuvo drops, and rhinestones all around. 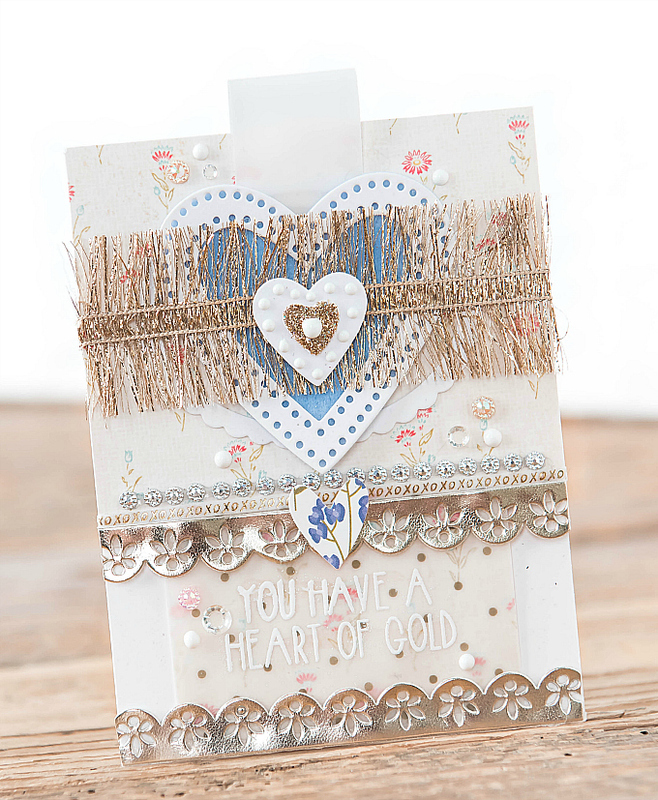 At the bottom of the card, I added a heat-embossed sentiment using Neat and Tangled's Heart of Gold stamps. Aren't these so sweet and just perfect for expressing the most immense gratitude?? As this wonderful Season is upon us, I feel even more grateful for all the blessings this year has brought us. Despite all the challenges, we're grateful for the many good things that have come our way and we look forward to another year of love, friendships, happiness and creativity. 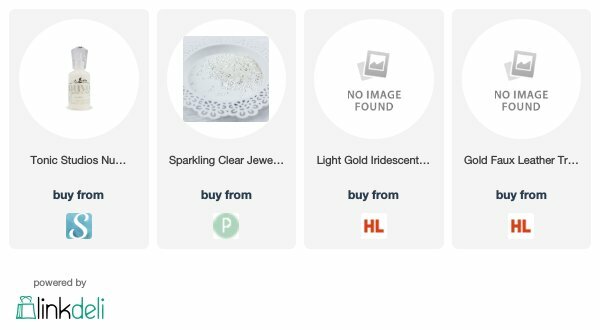 If you're already making your Valentine's cards, why not try a non-traditional palette like the one above? This is full of glitz and glam! Very fancy, very pretty! Thank you so much, Lisa! Sending big hugs and Merry Christmas wishes!